Ennoc is a Breton miner who lives in the Miner's Barracks for the Left Hand Mine in which he works. Ennoc will spend all of his time mining, not ever breaking from his duties to eat or sleep. 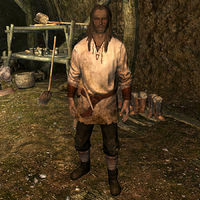 He wears a set of miner's clothes and boots, and he carries a pickaxe, a key to the Barracks, and some common items and gold. If you speak to Ennoc in Left Hand Mine, he will stay focused on his work, saying: "I'm just here to mine." or "Got ore to dig." This page was last modified on 21 November 2017, at 07:53.